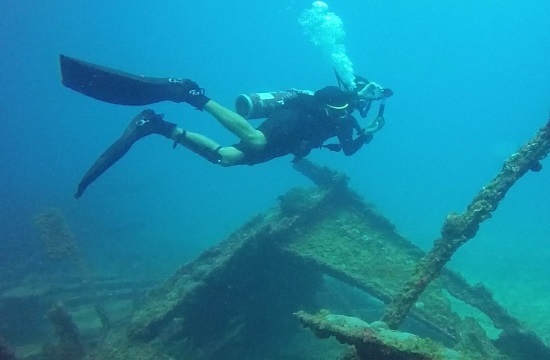 Greece is relaxing its strict regulations regarding its rich underwater heritage and has recently announced that it will allow divers to tour the sites of certain ancient shipwrecks, according to greekreporter.com. Until now, only archaeologists and divers with special permits could marvel at and explore the ancient finds in the deeps of the Aegean Sea due to fears that their precious antiquities would be looted. The first ancient shipwreck to be opened to the general public is near the island of Alonissos, in the northern Aegean. Divers will soon be permitted to tour the magnificent shipwreck of Peristera, named for the uninhabited Greek island opposite Alonissos where it was discovered in the early 1990s. The cargo ship was laden with thousands of amphorae, or vases, most likely containing wine, when it sank during the late fifth century BC. Non-divers will be able to experience the site through virtual reality in a nearby information center ashore. Thousands of ancient vases, the vast majority of them intact, lie in layers at the Peristera shipwreck site. Fish, sponges and other sea creatures have made the amphorae their home during the millennia, adding color and life to the site. In some places, the ancient ship’s cargo towers above divers as they swim along the perimeter of the wreck. Amazingly, the ancient shipwreck still keeps numerous mysteries to itself. Only a small part of it has been excavated, and experts have yet to determine how or why the ship sank, or what other treasures it might have carried beneath the estimated 4000 amphorae it carried in its hold.